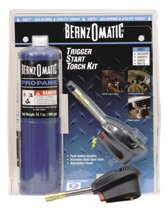 Includes: 14.1 oz Propane Cylinder, TS1500T Torch Head -brass tip for durability. Adjustable flame control. Gas Type Propane Stainless steel burn tube. Please call 800-663-9753 if you have further questions about this product or your order.